The innovative ASIC targets JEDEC-standard NVDIMM-N products enabling significantly lower cost and power versus existing solutions, while offering advanced features such as encryption. During backup and restore operations, AGIGARAM4 manages the transfer of critical data between the on-board DRAM and NAND Flash. The highly configurable memory controller supports a number of memory vendors and specifications, allowing considerable flexibility for customers and partners. AGIGARAM4 can significantly lower the total solution cost of NVDIMM-N products by eliminating the need for complex FPGAs and/or managed NAND/SSD controllers, while also shrinking the size of the energy source required to perform a backup operation. 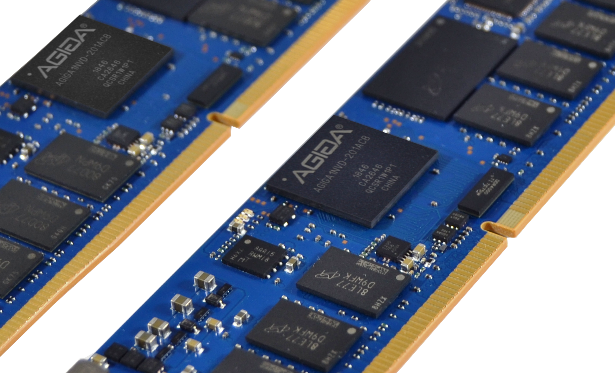 And with support for DRAM with integrated muxes, this helps to reduce cost and board space, while enhancing signal integrity and, most importantly, system performance. This all culminates in a more attractive NVDIMM-N solution for mainstream adoption by driving down the cost per IOPs. Samples and Reference Design Files for the AGIGARAM4 are available to participants in AgigA’s Early Access Program (EAP). Please visit our Contact page to inquire about more information. © 2019 AgigA Tech, Inc.